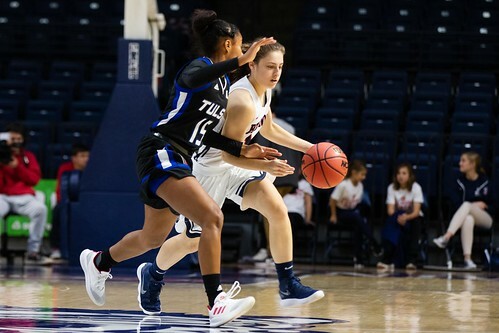 The Belmont women’s basketball team dominated University of Tulsa on Monday night, beating them 78-53. This was Belmont’s first win of the season, after the team lost its first game against NC State on Wednesday. The Bruins gained an early lead and held onto it for the rest of the first half, with a score of 45-19 at halftime. The second half was equally strong for the Bruins, who countered each of the Golden Hurricane’s efforts to close the gap. When the teams faced off last season in Oklahoma, the Bruins came out on top 90-65, and senior Darby Maggard tied a Belmont record by scoring nine 3-pointers. In Monday’s game, Maggard led the team with 19 points. Along with Maggard, senior Jenny Roy put on an incredible performance with six points, six rebounds and six assists. Freshman Maddie Cook was also a standout, tallying 10 points in her second game as a Bruin. Coming off of Monday’s victory, the Bruins will travel to Dayton to take on Wright State on Thursday at 6 p.m.. This article written by Teagan Malecha. Photos by Carina Eudy.